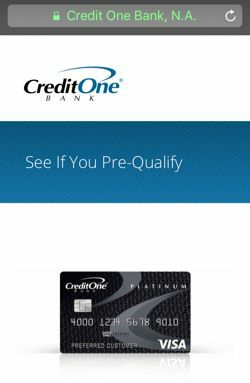 This card from Credit One Bank charges only an annual fee and unlike other subprime cards, does not charge any monthly fee or application fee. You also get a cash back program which is very rare for these types of cards. You will also get a free credit score. Most importantly, you are eligible for credit line increases. The grace period ranges from 0-24 days so you may get one that is less than a typical credit card. Your chances of approval are much higher if you have an income of at least $40,000, a bank account and have no recent late payments. Your credit score should be at least 600. You should also have a low credit utilization ratio (30% preferable). Below is a screenshot of the online application forms. You first go through a pre-approval process (soft pull) so you do not risk an unnecessary hard pull. 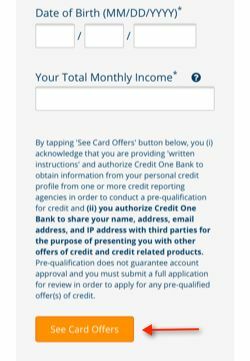 Before we look into the card details, I thought it would be important to look at who is Credit One Bank since there have been so many instances where the FTC has gone after subprime issuers for deceptive marketing practices. According to Wikipedia, Credit One is held by Credit One Financial, which itself is a wholly owned subsidiary of Sherman Financial Group. It is registered in Nevada. Credit One services approximately 2 million cardholders across the United States. Compared to other cards in this space, Credit One shines in terms of their fees and rates. Annual Fee - $0-99. While the fee has a range, the most common annual fee that folks get are $0, $35, $45 or $75 for the first year, then $99 for second year to be paid monthly. Compared to other subprime cards, the annual is very reasonable. APR - 20.24%-26.24%(Variable). This is very reasonable compared to it's peers (as you will see later). Application Fees - N.A. (many of Credit One's peers charge a one-time application fee just for applying for the card)! Monthly Maintenance Fee - N.A. Credit One does not charge any monthly maintenance fees (other cards charge this on top of an annual fee). 1.0% Cash Back Rewards on eligible Purchases. You will get your cash back in the form of statement credits. 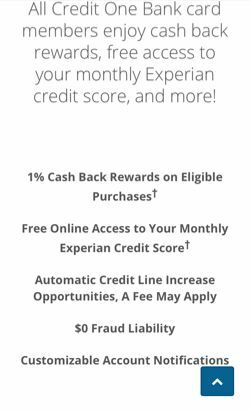 Though Credit One Bank is targeting folks with bad to fair credit, you need to meet certain criteria to increase your chances of approval. I am devoting a whole section of this review to how you can pay your bills with Credit One because they offer a few methods for you to pay your bills (each has it's pros and cons). Many folks in your situation end up with late payments and fees on subprime credit cards because they did not understand the nuances. Standard Pay Option - No Fee - This option is only available with a bank account. Payment will post (and funds will be available) within 7 days. Express Payment Option - $9.95 Fee - There are 2 ways to use the Express Payment Option. The first is to pay with a debit or ATM card. Payment will post (and funds will be available) the next day (if made between 2pm PST Sunday - Friday). If payment is made by 2pm PST Saturday, funds will be available in 2 days. The second way is to use your bank account. However, you will have to be aware of the following. For the first $100, payment will clear in 2 days (same period as above). Any amount above $100 will clear within 7 days. Check - Snail Mail - You can also pay by check over the mail. But you have to be aware that the effective payment date will be when the Bank receives it and NOT when you send it. If Credit One receives it after you due late, you will incur a late fee. Payments will also not be processed on public holidays. 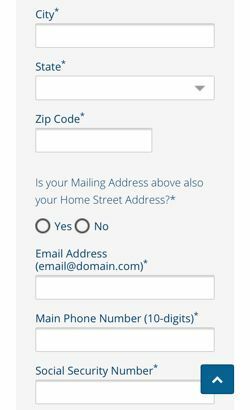 If you use this method, make sure you mail in advance and give yourself some leeway. Western Union and MoneyGram - You can also pay your bill via Western Union and MoneyGram. Credit One Bank will not charge any fees though Western Union and MoneyGram most certainly will. Payment will post the next day if paid by 2pm PST Sunday - Friday. Choose Your Payment Method Carefully - There are pros and cons to each payment method. Standard Pay option is free but you should allow 7-10 days to clear. Same with snail mail. Express pay via debit or ATM card or via Western Union and MoneyGram clear quickly, but you have to pay fees. As long as you are aware of number of days to clear, you should be ok.
Bank Verification - Another thing potential card holders should be aware of is that Credit One bank may perform bank account verification under some circumstances. Basically, they will deposit between $0.01 and $0.99 into your bank account and withdraw those amounts. 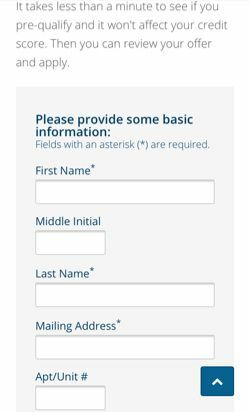 You will need to sign in to your "Online Access Account" and verify those amounts before you can use your bank account. This will happen the first time you want to use your bank account to pay your bill or if you get overzealous and pay your bills a few times a month (which is an unnecessary practice). It's kind of weird that I am writing about Credit One's policy of disputing a charge on your credit card but I thought it is very important because many complaints of this card around the web is a result of card holders not understanding the proper process of disputing a charge and blame bad customer service on the reps. Like many credit card companies, you need to write a letter to dispute a charge (they are not Amex!). The letter should include 1) your account number; 2) the name of the merchant; 3) a detailed explanation of your dispute; 4) the date that the charge was made; and, 5) the amount of the charge. You must also sign your letter. Mail your written dispute to: Credit One Bank, Attn: Dispute Department, P.O. Box 98876, Las Vegas, NV 89193-8876. You have to file the dispute within 60 days and Credit One will respond within 30 days of receiving your letter. The dispute process may take up to 60-60 days to resolve but Credit One's website say it will not exceed 2 billing cycles. There are quite a few cards today that has the same target market as Credit One (i.e. folks with bad to fair credit). And many of them come with very high fees and APR. In fact, one-time fees and monthly processing fees are not uncommon. Let us look at some of these cards. Continental Finance has a couple of cards like the Verve and Surge. For the first year, they tag on a $125 annual fee (higher than Credit One will ever charge you). On the second year, they look nice by reducing the annual fee to $96, but they tag on a monthly processing fee which works out to $120 a year. So all in all, you are paying over two hundred dollars if you have either of these cards from the second year onwards. APR is also sky high at 29.9%. First Access and Total Visa have almost identical fees (and both are worse than Credit One). They hit you with a one-time application fee of $89. During the first year, the annual fee is $75. Though they reduce it to $48 from the second year onwards, the tag on a monthly processing fee which works out to $75 annually. Rates are also at $29.9%. As you can see, Credit One beats these folks as well. First Premier charges a $95 application fee. During the first year, the annual fee is $75. This is reduced to $45 from the second year onwards but once again, they tag on a monthly maintenance fee which totals $75 a year. The APR is even worse at 36%. None of Credit One competitors offer any reward program or any online credit score tracking. In terms of fees and rates, Credit One is heads and shoulders above it's peers today. Let's just start off by saying that in terms of fees and rates, Credit One has the lowest among it's peers today. What I like is that they charge you an annual fee and that's it. There is no one-time application fee or any other fees on top of the annual membership fee. I also like the fact that you earn rewards (cash back in my opinion) for gasoline spending and grocery spending). I have never seen a card in this category has such a great reward program (let alone a reward program). They also have an online credit score tracker which will be useful for you as you can monitor your progress. If you apply and are approved for the card, here are some best practices to make sure you have a good experience with Credit One. Pay your bills in full - In fact, many cardholder have commented that when they paid their first statement and bill (which includes the annual fee) in full, they had better chances of getting credit line increases. Maintain a low utilization ratio - use at most 20% of your limit. So if your starting limit is $300, use $60 at most. Understand the payment methods - as we mentioned above, there different ways to pay your bills. Lots of folks end up with late payments because they do not understand how many days it takes payment to clear with the different methods. Understand them and you will be safe.